Today I am off to City West Hotel, Dublin to talk at the Mr Middleton Day but this week we have been picking lots of raspberries. I grow summer-fruiting and autumn-fruiting raspberries but if I had to choose just one, or recommend just one, it would be the autumn raspberries. There are several reasons but one of the most important is that pruning is so simple. Pruning seems to bother gardeners more than any other topic and when it comes to autumn raspberries all you have to do is cut them all down to ground level in winter. The fact that you do not have scruffy canes standing there in winter makes them easier to grow in large containers too and probably makes them better suited to cold climates too. I also like them because they crop for a very long time, depending on the weather, and if you grow them in a poly tunnel, as commercial growers do, you can pick them well into October. I am obviously not alone in the preference because although ‘Autumn Bliss’ was, for years, the only variety available, now there are several others, that are better, including ‘Joan J’ (my preference) and ‘Polka’. Another that I would recommend is ‘All Gold’. This appeared as a chance seedling in a bed of ‘Autumn Bliss’ and is similar (and thorny, unlike modern introductions) but has pale yellow fruits. They are not quite the gold colour shown in many illustrations but start off greenish yellow and ripen to a brighter yellow. Because they are not red when ripe they tend not to be eaten by the pesky blackbirds! Just as importantly, they taste good too. They tend to be, in my opinion, less ‘tart’ and sweeter than red raspberries and, if I am honest, less ‘raspberry-tasting’. That may sound as if they are bland and perhaps they are but they make eating them in the morning on your cereal less of an ordeal if, like me, you sometimes can’t quite face the tongue-twanging acidity of orange juice! 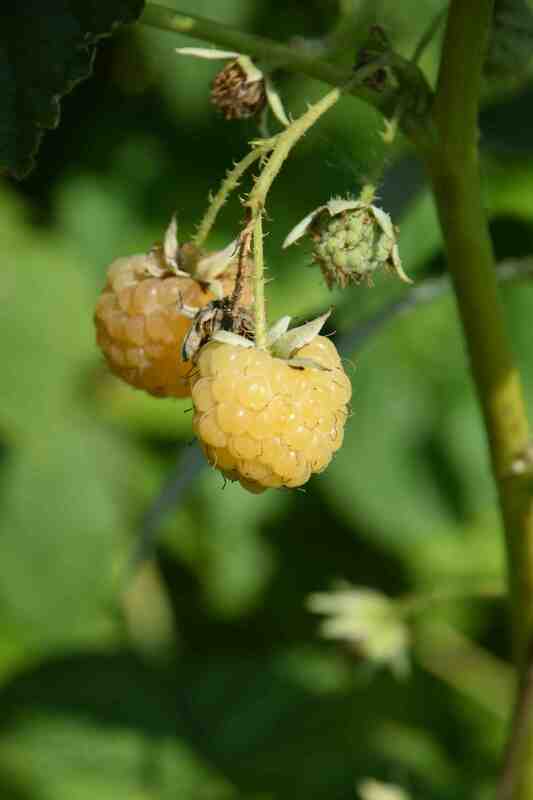 Of course there is the novelty of a yellow raspberry too. Because of the great weather we have had over the past few weeks the fruits have been ripening thick and fast with no grey mould which, to be fair, can often ruin the crop as we get into October and days, and nights, get cooler and wetter. Like all raspberries the plants benefit from support but they are more or less free-standing. They grow best in well-drained, acid or neutral soil and will not grow well on poor, chalky soils. Feed them in spring with a rose fertiliser and mulch with good garden compost or well rotted manure after pruning. A sunny spot is best, to help ripen the fruits apart from anything else, but a little shade is tolerated. Love raspberries and grow autumn ones… only tasted yellow ones this year in a N/T garden really liked them …we are now thinking of getting some to go with the red for the allotment…..got manure being delivered this morning ….busy day ahead…. Whats Mr Middleton Day ? It is interesting to read what type of raspberries are grown in different places. We grow ( midwest, usa) everbering types like Heritage and Carolina and I had our first crop this year:-) Small crop in late spring + better one later.I agree fall are the best! Golden ones look like one I might have to try! Thank you for shaing + great info! I will have to look up exactly what ‘everbearing’ means with raspberries unless it is autumn-fruiting since they will give a small early crop if you leave the previous years canes. Interesting and will have to look into that. Have you heard if you prune them in the spring you get a larger crop. I want to prune ours, but wonder-is this true? I guess we could prune half and leave the rest:-) see what happens, but our canes get out into the path sometimes! 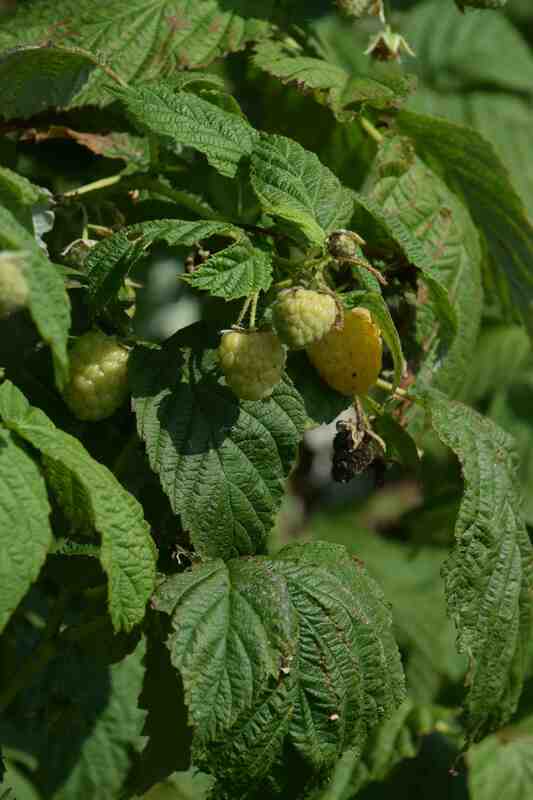 well – and assuming you are taking about raspberries – the autumn – bearers (primocane varieties) crop at the end of the growing season at the ends of the shoots and on a few sideshoots that grow from upper leaves. It is normal to prune these back to the ground in winter. But if they are left till the next year they often produce a few fruits from sideshoots but, because of this, the regrowth of new canes from the soil is reduced and they have less room to grow so the autumn crop is reduced. And yes – despite paying for raspberry canes, after a year or two they can be almost a weed.